In biology, a protein's shape is key to understanding how it causes disease or toxicity. Researchers who use X-rays to takes snapshots of proteins need a billion copies of the same protein stacked and packed into a neat crystal. Now, scientists using exceptionally bright and fast X-rays can take a picture that rivals conventional methods with a sheet of proteins just one protein molecule thick. 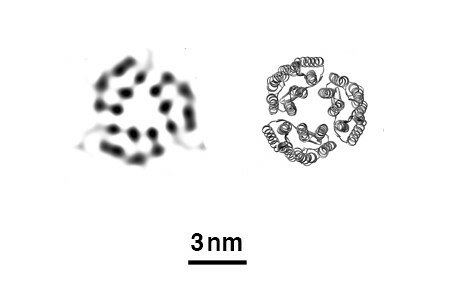 Caught by XFEL: X-ray free-electron lasers can create images (left) that accurately reflect the known structure of proteins determined by conventional methods (right), in this case, three bacteriorhodopsin proteins. RICHLAND, Wash. – In biology, a protein's shape is key to understanding how it causes disease or toxicity. Researchers who use X-rays to take snapshots of proteins need a billion copies of the same protein stacked and packed into a neat crystal. Now, scientists using exceptionally bright and fast X-rays can take a picture that rivals conventional methods with a sheet of proteins just one protein molecule thick. Using a type of laser known as XFEL, the technique opens the door to learning the structural details of almost 25 percent of known proteins, many of which have been overlooked due to their inability to stack properly. The team of researchers led by the Department of Energy's Pacific Northwest and Lawrence Livermore National Laboratories report their results with this unique form of X-ray diffraction in the March issue of the International Union of Crystallography Journal. "In this paper, we're proving it's possible to use an XFEL to study individual monolayers of protein," said PNNL microscopist James Evans. "Just being able to see any diffraction is brand new." Evans co-led the team of two dozen scientists with LLNL physicist Matthias Frank. The bright, fast X-rays were produced at the Linac Coherent Light Source at SLAC National Accelerator Laboratory in Menlo Park, Calif., the newest of DOE's major X-ray light source facilities at the national laboratories. LCLS, currently the world's most powerful X-ray laser, is an X-ray free-electron laser. It produces beams millions of times brighter than earlier X-ray light sources. Coming in at around 8 angstrom resolution (which can make out items a thousand times smaller than the width of a hair), the proteins appear slightly blurry but match the expected view based on previous research. Evans said this level of clarity would allow researchers, in some cases, to see how proteins change their shape as they interact with other proteins or molecules in their environment. To get a clearer view of protein monolayers using XFEL, the team will need to improve the resolution to 1 to 3 angstroms, as well as take images of the proteins at different angles, efforts that are currently underway. Researchers have been using X-ray crystallography for more than 60 years to determine the shape and form of proteins that form the widgets and gears of a living organism's cells. The conventional method requires, however, that proteins stack into a large crystal, similar to how oranges stack in a crate. The structure of more than 80,000 proteins have been determined this way, leading to breakthroughs in understanding of diseases, pathogens, and how organisms grow and develop. But many proteins found in nature do not stack easily. Some jut from the fatty membranes that cover cells, detecting and interacting with other cells and objects, such as viruses or bacteria, in the surrounding area. These proteins are not used to having others of their kind stack on top. These so-called membrane proteins make up about 25 percent of all proteins but only 2 percent of proteins that researchers have determined structures for. If successful, shorter flashes of XFEL might mean longer lines at SLAC. Evans is based at EMSL, the Environmental Molecular Sciences Laboratory at PNNL. This work was supported by the Department of Energy Office of Science, National Institutes of Health, National Science Foundation, Lawrence Livermore National Laboratory, and Pacific Northwest National Laboratory. Reference: Matthias Frank, David B. Carlson, Mark S. Hunter, Garth J. Williams, Marc Messerschmidt, Nadia A. Zatsepin, Anton Barty, W. Henry Benner, Kaiqin Chu, Alexander T. Graf, Stefan P. Hau-Riege, Richard A. Kirian, Celestino Padeste, Tommaso Pardini, Bill Pedrini, Brent Segelke, M. Marvin Seibert, John C. H. Spence, Ching-Ju Tsai, Stephen M. Lane, Xiao-Dan Li, Gebhard Schertler, Sebastien Boutet, Matthew Coleman and James E. Evans. Femtosecond X-ray Diffraction from Two-Dimensional Protein Crystals, International Union of Crystallography Journal, Feb. 10, 2014, DOI: 10.1107/S2052252514001444. SLAC's LCLS is the world's most powerful X-ray free-electron laser. A DOE national user facility, its highly focused beam shines a billion times brighter than previous X-ray sources to shed light on fundamental processes of chemistry, materials and energy science, technology and life itself. In this image generated by an electron microscope, the white dots are the protein ferritin. The dark circle in the middle is a bubble of liquid trapped within the graphene capsule enclosing the sample. A graphene water balloon may soon open up new vistas for scientists seeking to understand health and disease at the most fundamental level. Electron microscopes already provide amazingly clear images of samples just a few nanometers across. But if you want a good look at living tissue, look again. After such treatment, the blueberry isn’t what it was, and neither is human tissue. Shokuhfar, an assistant professor of mechanical engineering-engineering mechanics, wondered if there might be a way to make electron microscopes more friendly to biological samples. That way, you might get a much better view of what’s really going on at the sub-cellular level. The trick was to encapsulate the sample so that all the water stayed put while the electrons passed through freely. To do that, the team, including Robert F. Klie, an associate professor of physics and mechanical and industrial engineering at UIC, and UIC graduate student Canhui Wang, turned to graphene. “Graphene is just a single layer of carbon atoms, and electrons can go through it easily, but water does not,” Klie said. “If you put a drop of water on graphene and top it with graphene, it forms this little balloon of water.” The graphene is strong enough to hold the water inside, even within the vacuum of an electron microscope. The team tried their technique on a biochemical that plays a major role in human health: ferritin. “It’s a protein that stores and releases iron, which is critical for many body functions, and if ferritin isn’t working right, it may be contributing to lots of diseases, including Alzheimer’s and cancer,” Shokuhfar said. The team made a microscopic sandwich, with ferritin immersed in water as the filling and graphene as the bread, and sealed the edges. Then, using a scanning transmission electron microscope, they captured a variety of images showing ferritin’s atomic structure. In addition, they used a special type of spectroscopy to identify various atomic and electronic structures within the ferritin. Those images showed that the ferritin was releasing iron and pinpointed its specific form. If the technique were used to compare ferritin taken from diseased tissue with healthy ferritin, it could provide new insights into illness at the molecular level. Those discoveries could lead to new treatments. “I believe this will allow us to identify disease signatures in ferritin and many other proteins,” Shokuhfar said. An article on their work, “High-Resolution Electron Microscopy and Spectroscopy of Ferritin in Biocompatible Graphene Liquid Cells and Graphene Sandwiches,” was published Feb. 4 online in Advanced Materials. Qiao Qiao, formerly a graduate student in Klie's UIC lab and now a postdoctoral fellow at Vanderbilt University, is also a coauthor on the study. The work was funded by Michigan Technological University with additional support from a National Science Foundation grant to UIC, number DMR-0959470. The research was conducted at the University of Illinois-Chicago. Research from a team led by North Carolina State University is opening the door to smarter sensors by integrating the smart material vanadium dioxide (VO2) onto a silicon chip and using lasers to make the material magnetic. The advance paves the way for multifunctional spintronic smart sensors for use in military applications and next-generation spintronic devices. VO2 is currently used to make infrared sensors. By integrating VO2 as a single crystal onto a silicon substrate, the researchers have made it possible to create infrared smart sensors, in which the sensor and computational function are embedded on a single chip. This makes the sensor faster and more energy efficient, since it doesn’t have to send data to another chip to be processed. Smart sensors are also lighter than conventional ones, since separate chips aren’t necessary. “For military applications, sensor technology needs to be able to sense, manipulate, and respond to data quickly – and this work achieves that,” says Dr. Jay Narayan, John C. Fan Distinguished Chair Professor of Materials Science and Engineering at NC State and senior author of a paper describing the work. In addition, the researchers used high-power nanosecond-pulsed laser beams to modify the VO2 and make it magnetic. This will allow the creation of spintronic smart sensors that incorporate infrared sensors and magnetic sensors on a single chip. Spintronics refers to technologies used in solid-state devices that take advantage of the inherent spin in electrons and their related magnetic momentum. The potential advantages of spintronics include higher memory capacity, faster data transfer and more computational power on a computer chip. The paper, “Diamagnetic to ferromagnetic switching in VO2 epitaxial thin films by nanosecond excimer laser treatment,” is published online in Applied Physics Letters. Lead author of the paper is R. Molaei, a Ph.D. student at NC State. Co-authors include Dr. R. Bayati, a former Ph.D. student at NC State who now works at Intel Corporation; Dr. S. Nori, a postdoctoral researcher at NC State; Dr. D. Kumar, of North Carolina A&T University; and Dr. J.T. Prater of the Army Research Office, who is also an adjunct professor at NC State. The work was supported by the National Science Foundation, under grants DMR-1304607 and DMR-0803663. Authors: R. Molaei, S. Nori, and Jay Narayan, North Carolina State University; R. Bayati, Intel Corporation; D. Kumar, North Carolina A&T University; J.T. Prater, North Carolina State University and Army Research Office. Abstract: VO2(010)/NiO(111) epitaxial heterostructures were integrated with Si(100) substrates using a cubic yttria-stabilized zirconia (c-YSZ) buffer. The epitaxial alignment across the interfaces was determined to be VO2(010)‖NiO(111)‖c-YSZ(001)‖Si(001) and VO2‖NiO(110)‖c-YSZ(100)‖Si(100). The samples were subsequently treated by a single shot of a nanosecond KrF excimer laser. Pristine as-deposited film showed diamagnetic behavior, while laser annealed sample exhibited ferromagnetic behavior. The population of majority charge carriers (e−) and electrical conductivity increased by about two orders of magnitude following laser annealing. These observations are attributed to the introduction of oxygen vacancies into the VO2 thin films and the formation of V3+ defects. The car is racing far too fast toward the tail end of a traffic jam – a crash is inevitable. The inflated airbag can protect the car's occupants. But if the person in the passenger seat is leaning too far forward, perhaps looking for something in a bag in the foot space, the force of the airbag can cause injury. Researchers at the Fraunhofer Institute for Silicate Research ISC in Würzburg have now developed sensors that can help prevent such scenarios. These sensors can be integrated into the car seat, for example, where they detect not only if the seat is occupied but the position of the occupant as well. Is the person leaning over or sitting back in the seat? Is it a child or an adult? "The sensor films can measure stretch, as well as pressure," says Dr. Holger Böse, Scientific and Technical Manager of the ISC's Center Smart Materials. "They are made of a highly stretchable elastomeric film, coated on both sides with flexible electrodes. Whenever the sensor is stretched by changes in the shape of the seat, the sensor's thickness and, as a result, its electrical capacitance also change, which we can measure." In contrast to conventional, rather inelastic strain gauge strips, the new dielectric elastomeric sensors can stretch by up to 100 percent in extreme cases – in other words, they can be drawn out to twice their size. Depending on the field in which the smart materials are applied, it might be necessary to coat the elastomer film with multiple electrode pairs. This is the case, for example, when measuring the distribution of body pressure to determine a person's posture in a seat. Each pair of electrodes serves, in effect, as an independent sensor, measuring the local strain. "This is how we can say precisely where and to what degree the pressure has changed," explains Böse. In making the sensors, the researchers choose the material that best meets the specific requirements of each application. The elastomer film consists of a polymer in which the individual molecules are chemically bonded with one another. The better the network of molecules, the sturdier the material – similar to how a fine-mesh fishing net is stronger than one with a larger mesh. The degree of bonding in the polymer can be controlled by the scientists. "If the sensor is being used to measure high pressures, we produce a sturdier elastomer film as substrate; for measuring lower pressures, we use more pliant films," says Böse. These sensors have numerous applications. For instance, they can be used to measure the pressure of gases. To do this, the elastomer film is stretched like a membrane across a ring. If gas exerts pressure on the sensor membrane, it deforms – which is detected by the sensor. Pressure sensors are also useful in safety technology: If someone enters an area too close to a hazardous machine, sensors embedded in the floor can detect this and set off a warning. These intelligent materials could even be integrated into clothing: Here, they might be used to analyze sequences of movement, thereby helping athletes to optimize their training. Because they are so flexible, sensors that are part of clothing are hardly noticeable at all. At the Sensor+Test trade fair from June 7-9, 2011, researchers will be performing a variety of demonstrations (Hall 12, Booth 202). In a few years – the experts hope – the sensors could be ready for market. Liu, professor of mechanical engineering and electrical engineering and computer science at Northwestern University's McCormick School of Engineering and Applied Science, is using insights from nature as inspiration for both touch and flow sensors — areas that currently lack good sensors for recording and communicating the senses. Liu will discuss his research in a symposium at the annual meeting of the American Association for the Advancement of Science (AAAS) in Washington, D.C., to be held from 1:30 to 4:30 p.m. Saturday, Feb. 19. "The hair cell is interesting because biology uses this same fundamental structure to serve a variety of purposes," Liu says. "This differs from how engineers typically design sensors, which are often used for a specific task." Liu's current focus is the medical application of these biologically inspired sensors. He hopes that artificial hair cells could be used to measure acoustics in an artificial cochlea or could be embedded as flow sensors in a wide variety of medical devices. "During a heart treatment, the doctor controlling the catheter has no sense of touch and cannot tell if the catheter has touched the heart wall and successfully completed the therapeutic treatment," Liu explains. "We want to use microfabrication technology to put sensors on the end of the catheter to provide feedback." "Using a bio-inspired approach is really important," Chang says. "Nature has a lot of wonderful examples that can challenge us. No matter how good some of our technology is, we still can't do some of the basic things that nature can. Nature holds the secret for the next technology breakthrough and disruptive innovation. We are on a mission to find it." functioning like hyper-attentive butlers, anticipating and fulfilling peoples' needs without having to be told. Life would not only be more convenient, it might even last longer: Devices could monitor people's health and step in when needed to help them get better. The technology propelling this new generation of personal assistants is a combination of sophisticated sensors and carefully tailored computer software. As envisioned, the machines would adjust their own actions to the preferences and needs of an individual, by analyzing data on the person's past actions and monitoring current behavior with cameras, audio recorders, and other sensors. Santa Clara, Calif., chipmaker Intel, which has been studying the technology for several years, believes that one day soon the gadgets will have the ability to read their owner's emotions. While some experts have proposed that face and voice recognition gear be used to detect a person's disposition, Intel has been experimenting with heart monitors and galvanic skin-response sensors. A study it did last year envisioned the gadgets detecting mood swings "while people are driving, singing, chatting with friends, attending a boring meeting and even while going to the dentist." possibly by joking." Although some gadgets already make assumptions about what people want, such as word processing software that automatically corrects grammar, the devices contemplated by Intel, HP and other companies would be capable of much more sophisticated judgments about a broader array of human needs. That's a complex task -- so difficult that some experts are skeptical the technology will be ready in the near future. "My guess is that we will get there in time, but it's a little further off than the most ambitious nnouncements from a lot of companies have indicated," said Bob Sloan, who heads the computer science department at the University of Illinois at Chicago. "There are a lot of hard problems to solve." act autonomously on their behalf, assuming the individuals let the gizmos have that authority. One product that already claims to partly think for its owner is a "personal assistant" app for the iPhone and iPod developed by Siri, a San Jose company Apple bought in April. products could be on the way soon, said Diane Cook, a researcher at Washington State University, which has an experimental smart house filled with such devices. "We have companies large and small and in-between visiting us monthly -- IBM, Bosch, Qualcomm -- all wanting to commercialize it, all trying to decide what that first step is, that first niche," she said. Stanford University operates a similar research lab. When it hosted a workshop on the technology three weeks ago, it attracted interest from Facebook, Google, Honda, Intel, Microsoft, Nokia, Panasonic, Sony and Hewlett-Packard, according to the lab's website. Hamid Aghajan, who supervises the lab, foresees gadgets knowing enough about their human housemates to select appropriate lighting and music when the people are eating or reading, coaching them on their speaking skills during meetings and connecting them via social networking sites with people the gadgets determine share their interests. Peter Harwell, a senior researcher at HP, believes such devices could be built into new homes within a decade or so, though he cautions they must operate "in a way that doesn't annoy the user." One initial application of the technology is expected to be monitoring the elderly in their homes. Oregon Health & Science University researchers say they have detected the onset of dementia in older people by using smart pill containers that record whether the person takes their medicine and motion sensors that can tell if their walking and dressing slowed, potential early signs of the disease. Some experts believe it will be possible for a refrigerator with the right sensors to keep track of how much a person eats and to urge them verbally to adjust their calorie intake. And if the person gets seriously sick, these experts say, other gadgets might be able to detect the illness and alert authorities. Even the military is interested. The Defense Advanced Research Projects Agency hopes to develop computerized assistants for commanders that "can reason, learn from experience, be told what to do, explain what they are doing, reflect on their experience and respond robustly to surprise." All this raises concerns for Eric Goldman, who directs Santa Clara University's High Tech Law Institute. One issue is how to protect the privacy of the information the gadgets accumulate on people. "The more data we gather the more the government is going to want to get its paws on it," he said, adding that lawyers in court cases may try to obtain it, too. There also is no guarantee such a device "will do exactly what we want it to," he warned. "There is always the possibility that the smart agent will go rogue." But others consider the potential benefits worth pursuing. That includes using the technology to rescue people from uncomfortable situations. If a person gets a call from someone who stresses them out, according to Intel officials, their savvy phone might automatically switch the caller into a voice message. Another intriguing possibility could arise if the phone notices its owner is extremely tense in a meeting, added Lama Nachman, a researcher at the chipmaker. In that case, it might respond with what she termed an "exit phone call," a bogus ring that gives the person a convenient excuse to leave. The problem with today's medical tests is that they don't happen in real time. They are asynchronous-there is often a time delay between the test and the actual results- HIV, HIN1, biopsies, influenza etc. Kwon’s sensor research has been published in the IEEE International Conference on Solid-state, Sensors, Actuators and Microsystems and the IEEE Conference on Sensors. Who do think is better at creating an efficent, cost-effective and resilient network...1) communication network engineers designing the Tokyo railway system or 2) Nature i.e. the ordinary slime mould? Well if you picked choice number 2).. Nature... you'd be right. In an experiment comparing the growth of Physarum polycephalum (slime mould) against an existing man-made network, the slime mould performed admirably, as good as or better then human designed networks. "Physarum is a large, single-celled amoeboid organism that forages for patchily distributed food sources... [It] can find the shortest path through a maze or connect different arrays of food sources in an efficient manner with low total length yet short average minimum distance between pairs of food sources, with a high degree of fault tolerance to accidental disconnection." The researchers knew that capturing the essence of this biological system in simple rules could be useful to inform the construction of self-organizing and cost-efficient networks in the real world. They captured the core mechanisms needed by the slime mold to connect its food sources in an efficient manner and incorporated them into a mathematical model. Since the slime mold has been subjected to countless rounds of evolutionary selection, this formula based on its feeding habits might provide a route to more efficient and adaptive network designs for transportation and communication. "The model captures the basic dynamics of network adaptability through interaction of local rules, and produces networks with properties comparable to or better than those of real-world infrastructure networks... This work provides a fascinating and convincing example that biologically inspired pure mathematical models can lead to completely new, highly efficient algorithms able to provide technical systems with essential features of living systems, for applications in such areas as computer science." The model provides a starting point for improving efficiency and decreasing costs for self-organized networks without centralized control, like remote sensor arrays (smart dust), mobile ad hoc networks, and wireless mesh networks. A practical application of this can be used in war to save lives. I always thought that our troops in Afghanistan should be using "smart dust" or wireless mesh networks sprinkled along the roadside to identify suspicious movements along roads, as proxy indicator for terrorists, who regularly plant improvised explosive devices ( IED's) at night. Algorithms could be designed to distinguish between expected and unexpected incidents/ movements (humans vs animals). These sensors are inexpensive, now costing pennies each and have a range of 50 feet. Life just got harder for the bad guys but more costly for the good guys. With terrorism back in the news (Pakistan, Iran, Amsterdam, Detroit, Yemen etc), it's some comfort to see that scientists at the Fraunhofer Institute in Germany have designed a new intelligent prototype system to help identify terrorists carrying explosives. A network of sensitive electronic noses capture the smell of the explosives; the system processes the acquired data, correlates it with individuals’ movements … and ultimately tracks down the suspects. It's a better idea then a terra-hertz fully body scanner-which is still dependent on error-prone subjective human judgement and can't distingished between an ordinary shirt or jacket lining or one soaked in explosive chemicals-a new tactic that could be easily used by clever savvy future terrorists. trail. There are oscillating crystals on the sensor chips, and whenever the electronic noses capture chemical molecules, their oscillation frequency changes. The precise nature of the change is different for different substances. A further component in the system – the sensor’s data fusion function – traces the explosive’s path and ferrets out the carrier. A second sensor network is needed to track the route the individual takes; for this, the researchers have used laser scanners. “HAMLeT’s real achievement is its ability to collate all the data and convert it into a clear and accurate overall picture,” says Koch. The sensor data fusion process employs complex algorithms which allow HAMLeT to build up a precise image of pedestrian flows and connect a particular smell with a specific individual. ETA: prototype stage-1-5 years before we see it in airports and possibly other high security venues. But don't rejoice for to long....and sit back smug and complacent. Now terrorists will just switch to something more deadly -cyberterrorism, possibly joining up with hackers from the Russian mafia. N.B. If Bin Laden's strategy is to bankrupt the west, then he is on track. Even a failed bomb attack will trigger an anticipated kneejerk reaction from authorities and "some new program" which will ultimately cost everyone much more money and time.